It’s easy to be misled by warranties written by asphalt manufacturers. The sad thing is, many of us take them at face value instead of really reading what the warranty covers. In every asphalt warranty, it’s clear that what the bulk of the warranty covers is “manufacturing defects”. This simply means that for as long as they state, which is often 50 years or “lifetime”, nothing they’ve done in the manufacturing process will cause their material to fail. Read on a little further in the warranty documentation and you’ll soon realize that the circumstances that cause your roof to fail are not covered, or are covered for a limited amount of time before they pro-rate heavily. Pro-ration insures the manufacturer that by the time you need the warranty, it will be expired, or worth pennies on the dollar. They say that asphalt roofing only makes sense for the rich. They can afford to do it over, and over, and over again. 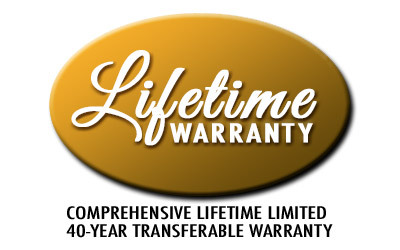 Kassel & Irons Lifetime/40-Year Transferable Limited Warranty serves as your reminder of the product’s “Best in Industry” protection. As long as you own your home, Kassel & Irons Lifetime Warranty is in full effect and never pro-rates. And unlike many other roofing warranties, the Kassel & Irons warranty transfers to all future owners during the first 40 years after installation, is still not pro-rated, and provides not only replacement materials but also replacement labor should a warranted failure occur. So which would you choose, a product designed to fail with pro-rated warranty that covers “manufacturing defects,” or a lifetime product with a warranty that is not pro-rated, and covers materials AND labor? We at Distinctive Metal Roofing think that the choice is easy…especially with the weather here in Cleveland and Pittsburgh. How about you?